Oh, hello! I'm hoping you are either visiting because you've always visited and listened to me talk about all manner of life and baking, or that you've landed here after watching the Today show. Welcome! As soon as I get back from New York, I'll be diving into the fall and holiday chapters of the new book, and testing lots of great recipes to share with you. One of the best things about creating this new book is that the timeline of developing the manuscript is allowing me to bake my way through the year--we just finished a season of light cakes, ice creams, summer fruit pies, cobblers, dessert salads, and way more. And now, after a solid week of unwavering, sweaty, snappy-retort-causing 90-degree-plus temps in Chicago--the heat seems to have finally broken, and from beneath it I can feel some great baking inspiration rising. And hey, speaking of rising, how are you feeling about yeast-raised doughs at this point in your baking life? (Heyyyy-ooooh! Tip the bartender on your way out!) For the longest time, they scared me in a totally irrational way. It all seemed way too touchy and volatile, and generally way too easy to mess up. So I either avoided yeast doughs altogether, or stuck to the plethora of no-knead bread recipes available on the internet. But now it's different. I've learned that the trick to great bread is to just keep making freaking bread. Lots of lots of bread, much of it bad. And then suddenly, it will stop being bad. You'll learn what the silky texture of a dough really means and when you achieve it, and if it's not feeling silky and buoyant, how you must continue to work it to get it there. You also learn that if you're me, against all your old-fashioned homesteading dreams, even just 10 minutes of hand-kneading is incredibly boring and that you get better, quicker results from using a mixer for the heavy lifting, and finishing the kneading with just a few minutes by hand, to enjoy the feel of the dough when it's really in its kneaded prime. And I feel great about that discovery. It's brought a whole lot more joy to my bread-making life, I'll tell you that right now. 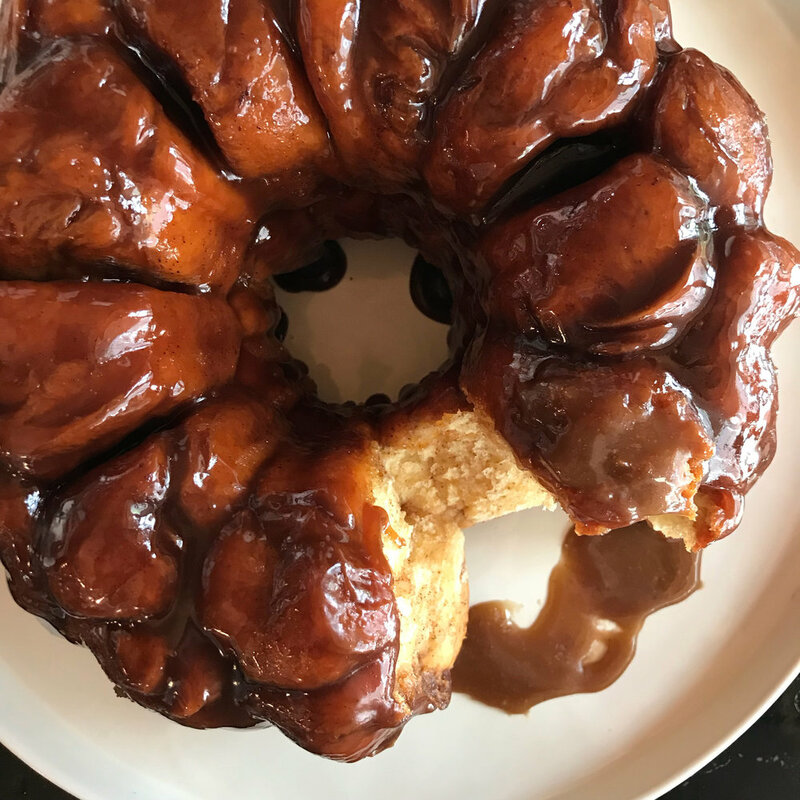 One of the most adorable and delicious ways to use a homemade white bread dough is monkey bread, that midwestern classic. For me, it's evocative of many a Chicago-suburbian slumber party in my school days, bake sales and church basements and snow days at other people's houses (my mother is many things, but she is not a baker. Except for this and this, and these two things are perfect). The good news is that you don't need to make from-scratch bread dough to bake up a great monkey bread. Now this doesn't mean that I think the Pinteresting trends of using canned biscuits and what not are a grand idea in this case. To me, the genuine article when it comes to monkey bread means that the dough is yeasted. So when I'm short on time or the will to live, I use frozen bread dough, either in 1-pound loaves, or the frozen individual dinner rolls that are designed to have a rise time before baking--the rolls are especially great because they require only a crosswise snip with kitchen scissors to make them just the right size. From there, you can go many different ways--simply rolling the dough balls in butter and then cinnamon-sugar and stuffing them into a bundt pan, or you can gild the lily by dousing the whole buttery, spicy, sugary lot in a sweet caramel syrup to make it even more irresistible. I'll give you zero seconds to guess which method I prefer. A few tips for success: First, cold dough will cut and shape much more easily. Second, if the bread begins to billow out of the pan during baking, just carefully and gently press it back down into the pan while it's in the oven--sometimes the caramel syrup can steam underneath the dough and send it upwards. And lastly, be sure to allow the bread to settle in the pan for about 20 minutes before turning it out. Spray a 10-inch Bundt or tube pan with nonstick cooking spray and set it on a rimmed baking sheet. Cut the dough into small pieces and roll into 1-inch balls. In a medium bowl, whisk together the sugar, cinnamon, and salt. Lightly coat the dough balls with melted butter, then toss them in the sugar to coat. Fit the dough balls into the pan. Cover the pan with a clean tea towel or plastic wrap and set aside in a warm place to rise until doubled in volume, about 1 hour. Position a rack to the center of the oven and preheat it to 350°F. In a medium saucepan set over high heat, combine the coffee, butter, brown sugar, and salt. Bring the mixture to a boil, stirring often until the sugar is dissolved. Boil for two minutes, until slightly thickened. Immediately pour the caramel over the risen dough. Bake until puffed and golden, 35 to 40 minutes. Let cool on a wire rack for about 20 minutes before inverting onto a platter and serving warm.